In March, the rusty patch bumble bee was declared endangered. We’ve heard a lot about how habitat loss and pesticide use is affecting honey bee and monarch butterfly populations, but wild bee populations are feeling the impact as well. 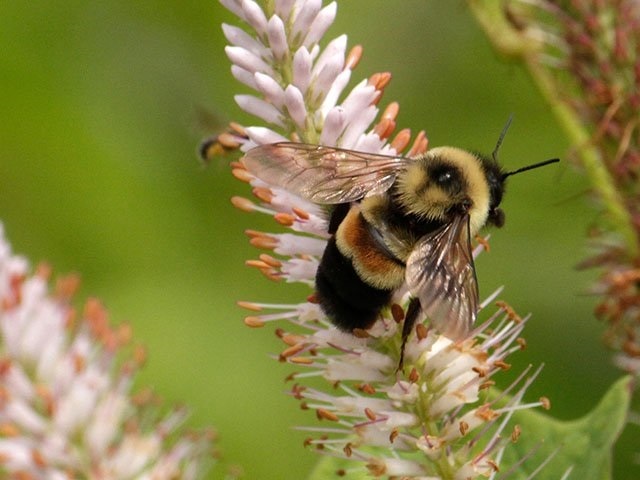 In March, the rusty patched bumble bee was listed as an endangered species. One of the places this species is still found is right here in Madison. A visiting bee expert from California found a rusty patched bumble bee at the UW Arboretum in 2010, says Susan Carpenter, a native plant gardener there. Now the organization has a group of volunteers keeping an eye out for this species, as well as the 11 other bumble bee species found on the 1,200 acres. While pathogens, pesticides and climate change are all contributing elements, “loss of flowers is thought to be the number one factor in bee decline,” says UW entomologist Jeremy Hemberger. That’s because nectar and pollen are the buzzing insects’ sole food source. The presence of wildflowers can in fact serve as a way to predict the presence of wild bees, Hemberger says. Like honey bees, bumble bees are used commercially as pollinators, so their conservation is important to Wisconsin’s farmers. Hemberger studies how bumble bees interact with cranberry fields in the Central Sands region of Wisconsin. “Cranberry growers are intimately tied to the health of bee populations,” he says. Cranberries need pollinators, and renting honey bees for the job is expensive, so farmers have an incentive to attract as many wild bees as possible. To do this they may need to plant more wildflowers to provide additional food. Unlike honey bees, bumble bees only store a small amount of nectar in their nests, maybe one or two days worth, Carpenter explains, so they need flowers available all the time for a food source. While the cranberries provide ample blossoms during the middle of summer (increasing the number of blooms available by 500 percent, according to Hemberger), bees need food sources early and late in the growing season as well. The queens, which are the only members of the colony to survive winter, need food in the spring to lay eggs and in the late summer to get themselves through the coming winter. Given bees’ value as pollinators, it makes financial sense for cranberry growers to use as little pesticide as possible, avoid spraying during the bloom and avoid systemic pesticides like neonicotinoids, Hemberger says. This class of pesticides has been found to be harmful to bees, and is banned in some places. Many of the farmers Hemberger works with also use non-toxic pest control methods, such as flooding their fields in the spring to wash away insect larva and pupa. Hemberger is working to create a statistical model where farmers can input data and predict bee populations. The tool would show how any actions they took, such as planting specific wildflowers or spraying pesticides at a certain time, would likely impact bee numbers. The rusty patched bumble bee is found mostly in the upper Midwest and has lost much of its southern and eastern range. “Bumble bees are more of a cool climate organism,” Carpenter says. Their predilection for cooler weather means bumble bees will be out pollinating even in overcast, windy or rainy weather, whereas their Mediterranean cousins, the honey bees, aren’t as active in inclement weather, Hemberger says. Just as farmers can attract more bees by planting wildflowers, so too can home gardeners. Carpenter has seen a rusty patched bumble bee in her yard. Just be careful not to buy plants that have been pre-treated with insecticides, she warns. There are no labeling requirements, but buying from native plant nurseries or buying plants labeled organic are safe bets. Carpenter emphasizes observation as the ultimate measure of success; seeing bees on the flowers means they like the plant. Sometimes bees won’t use cultivated varieties of the same species of a plant they normally frequent, she says. And if you are lucky enough to see a rare bumble bee like the rusty patched, researchers want to know, so take a photo and report it at bumblebeewatch.org. Anyone interested in attending a volunteer training at the Arboretum can contact info@arboretum.wisc.edu.